Primitive Country Gingerbread Hand Painted Tissue Box Cover. 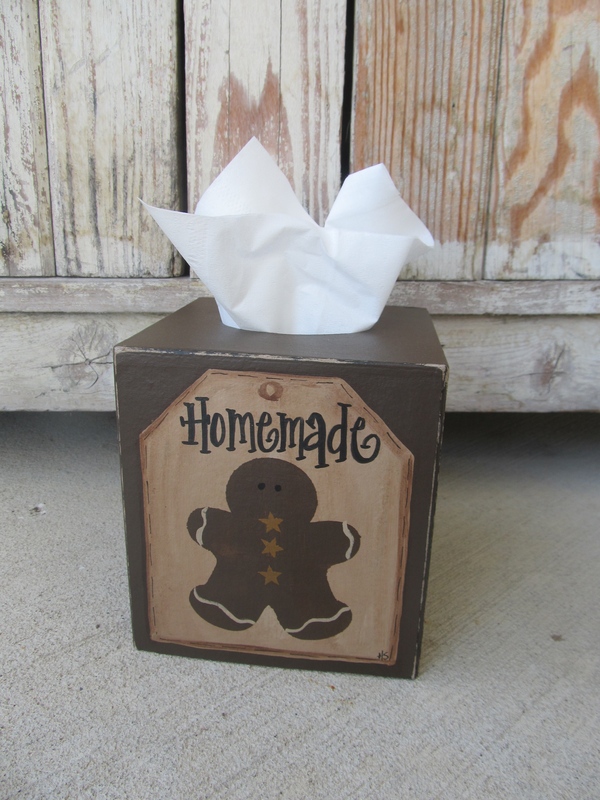 Country Style Gingerbread Hand Painted Tissue box cover. Paper mache. I've hand painted this tissue box cover to make it look like a primitive hang tag it on the front. Inside I painted a gingerbread with star buttons and icing. The saying is HOMEMADE. Stitching has been painted on around the "tags" edges. You can choose your side colors of the tissue box. Pictured in Milk Chocolate Brown. Size is for boutique style tissue boxes, 5"x5"x5". Hand painted, designed and signed by Heidi.